Nataraja, Shiva as cosmic dancer, is an attempt by human mind to capture the cosmic creation. Nataraja Shiva at Chidambaram Temple in Tamil Nadu is of great significance as Shiva performed the Ananda Tandavam here. The story of Nataraja Dance performed here begins when a sect of people named Vamvargis are blinded by faith and lead the path of Adharma. They forced people to join their sect and follow Adharmic practices. Shiva objected to cruelty in the name of worship and tried to make them understand Dharma. Vamvargis did not listen to Shiva and decided to belittle him through confrontation. The senior priests of the sect first produced a poisonous snake from fire and threw it at Shiva. With a smile, Shiva made the snake his garland. Then the priests unleashed a fierce tiger on Shiva. Within a blink of an eye, the tiger was subdued and Shiva tore the tiger skin with his little nail finger and wrapped it around him. 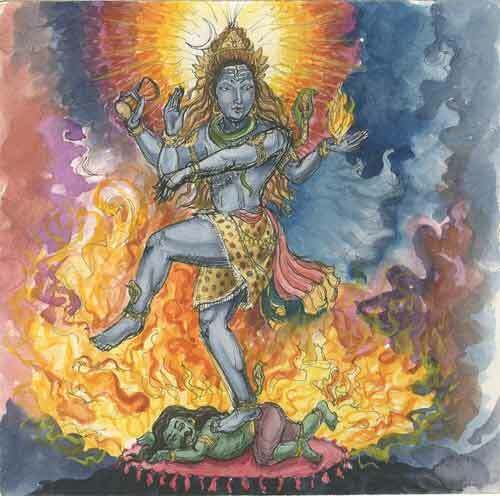 The priests then unleashed a dwarf sized demon – Apasmara Purusha – who was crushed by Shiva. With no more tricks left, the priests fled the scene and Shiva performed Ananda Tandavam.